Caption: Confocal microscopy is used to visualize the activity of the sox9b gene (green) in the developing zebrafish fin; collagen (red), DNA (blue). It’s not every day that you can take flight on a fantastic voyage without leaving the airport. But that’s what will happen if you visit the Life:Magnified exhibit currently on display at Washington Dulles International Airport. If you only glimpse the exhibit as you’re running to catch a flight, you’ll probably think it’s an art display: gorgeous modern photography. Look closer. You’ll find cells and other of life’s tiniest parts—blood, brain, and cancer cells; bacteria, viruses, even gecko toe hairs—all magnified up to 50,000 times, using the latest microscopy techniques. A stunning array of colors have been added to the images, not only to enhance their visual appeal, but also (even primarily!) to help scientists conduct biomedical research. And, as you browse the images, you can take a journey through a part of the biological world that, though rarely seen, is within and all around us. 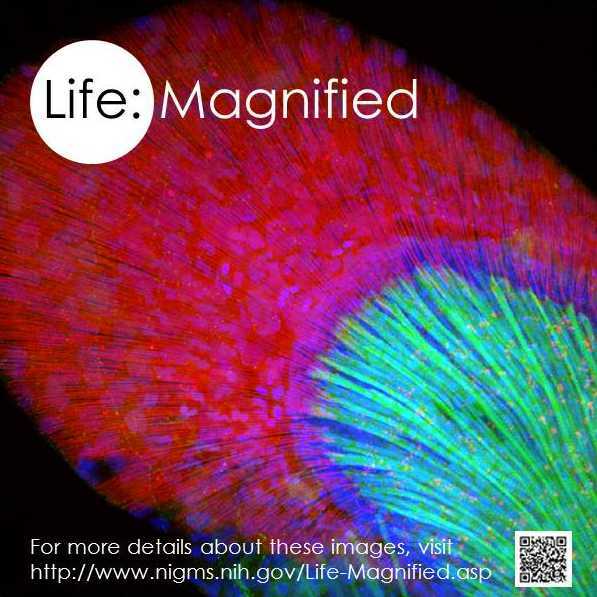 NIH-funded researchers created many of these 46 images, which were selected from more than 600 submissions by a panel composed of judges from our own National Institute of General Medical Sciences (NIGMS) and the American Society for Cell Biology (ASCB). The cells and structures featured are derived not only from humans, but also from a range of model organisms—flies, fish, mice, and plants—that are vital for generating important insights into health and disease. Part of the fun of this exhibit is guessing the subject of each image. Take, for example, the image featured in the event’s poster (and this blog’s banner). It’s actually the developing fin of a zebrafish. Jessica Plavicki, a developmental biologist now based at the University of Wisconsin–Madison, is using the zebrafish to study the impact of environmental contaminants on the developing embryo. Plavicki and colleagues engineered a fish that expresses green fluorescent protein everywhere the sox9b gene (which is disrupted by pollutants called dioxins) is normally active during development . In this image of the developing fish fin, sox9b activity appears green, activity of the collagen gene appears red, and DNA is blue. When the colors overlap, turquoise and purple tones are created. When Plavicki saw the image, she was instantly taken with its beauty. I expect you will be, too. The exhibit, which runs through November 2014, is cosponsored by NIGMS, ASCB, and the Metropolitan Washington Airports Authority’s Arts Program—which seeks to enrich the travel experience by showcasing elements from the nation’s capital and surrounding areas. If your travel plans don’t take you through Dulles, I hope you’ll view the exhibit online. There, you’ll find all the images and their descriptions—as well as, I suspect, a multi-year supply of screensavers and wallpaper. Also, I plan to share some of these images, and the science behind them, on this blog, as the next round of selections for my periodic “Snapshots of Life” series. Art and science combine wonderfully in this exhibit—enjoy the images! My daughter’s class in 5th grade is studying cells. Am I allowed to forward these images (they are on display at Dulles Airport) to the class teacher so that they can be shared? Yes–please share with your daughter’s teacher! All of these images are in the public domain, and are freely available for educational, news media, or research purposes, provided the source for each is credited. Would it be possible to have this exhibit at a small Art Museum in Florida on the Gulf of Mexico? A few Board of Directors love this exhibit!